In comparison with the high drama of 1997, the 2001 election was considered a boring event. In 1997, 184 seats changed hands, 18 years of one party government ended and the political topography of Britain was profoundly changed. In 2001, only 27 seats changed hands, no government fell and the impact was infinitesimal. In addition, the 2001 election was hardly civic Britain's finest hour, with a turnout of 59%, the lowest at a general election since 1918. But it should also be acknowledged that 2001's quiet election was in many ways more remarkable than its seismic predecessor. Labour not only secured an unprecedented second full term but did so with barely a dent to the party's majority, dashing Conservative hopes of a swift return to form. 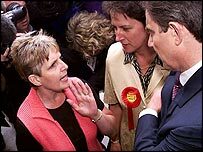 The 2001 election was originally scheduled for early May - four years almost to the day after 1997's Labour landslide - but was put back to June because of the foot-and-mouth crisis. A second Labour victory seemed a foregone conclusion: since 1997 the party had won every by-election it defended - the first government to do so for almost a century. The government had suffered some crises - including fuel tax protests and accusations of sleaze - but a strong economy had shored up support in middle England. However, Labour supporters were concerned that voter apathy would translate into Conservative gains at the ballot box. 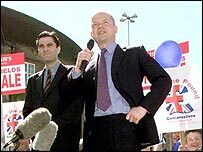 The Conservatives were still split over key issues such as Europe and while Tory leader William Hague would never have admitted it publicly, 2001 was all about trying to mend a substantial portion of the damage suffered in 1997, rather than winning. As it turned out, neither goal would be achieved. Public interest was low from the word go. In fact in the first few days of the campaign Tony Blair's decision to announce the election while visiting a school seemed more of an issue than the details of manifestos. But a boring campaign was enlivened by a series of unpredictable events. Tory shadow treasury minister Oliver Letwin let slip that the party was planning a £20 billion cut in public spending - far beyond the official Conservative stance of £8 billion. 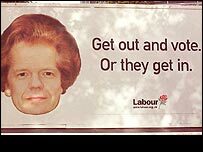 He promptly went into hiding and Labour put up "wanted" posters for him. Margaret Thatcher also added to Hague's problems by going off-message in her one major public speech by saying "never" to joining the euro - to a thunderous reception. But Labour had its own troubles to deal with. Three of them came on one day when Blair was confronted by the angry partner of a cancer patient; Jack Straw was heckled by the police federation and, most sensationally, Deputy PM John Prescott punched an egg throwing protester in Rhyl. Race riots in Oldham were a nasty punctuation point during the month and may well have served to boost the BNP to its best ever general election success. 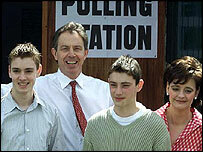 Blair was a remarkably popular prime minister in 2001. The fuel protests of 2000 had seen the first stirrings of a rural backlash but polls during the campaign showed Blair's personal standing was still around 50%. Hague was a witty sparring partner to Blair in the Commons but his oratory skills were not enough to make an impression on voters during the campaign. His age (36), and memories of his precocious speech to conference as a 16 year-old, dogged him as the press lampooned him as a foetus. The mockery intensified over his claims to once have drunk 14 pints in one night. Hague was also hamstrung by interventions from two former Conservative prime ministers. Ted Heath described him to the Spectator as "a laughing stock" and Lady Thatcher's joke "The mummy returns" backfired. 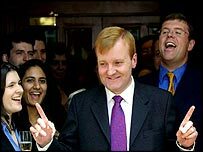 The leader whose status rose most dramatically during the campaign was Charles Kennedy. A relatively quiet campaign for the other two parties saw him get plenty of TV and press coverage and he came out the month looking like a heavyweight politician. Health and education were big issues during the campaign with Labour pledging "the work goes on" to plough more money into hospitals and schools. 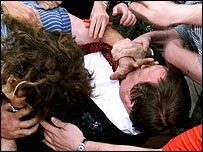 However, the party scored an own goal when Tony Blair was accosted by angry Sharron Storer during a hospital walkabout. Her partner, a cancer sufferer, had had his treatment delayed repeatedly and she berated the Prime Minister at length. Both parties tested the public's reaction to Europe. Tony Blair focussed on the EU's place in the world while William Hague campaigned to "save the pound". But neither seemed to strike a chord with voters - especially floating voters. Apathy itself became an issue with pundits and politicians worrying about the health of democracy in the country.